The Economist Businesswomen Club last Friday held an exciting networking breakfast at Arebbusch Travel Lodge where the ladies were treated to an inspiring session by Eleni Skincare Namibia. The breakfast took the form of a High Tea Party with a difference that included a luxury mini facial with a twist. The ladies also stood a chance to win a Mother’s Day special voucher at Oukolele Day Spa, valued at N$1380, which was won by Angrid Shimuafeni (third from left), Client Service Manager at MetHealth Namibia. 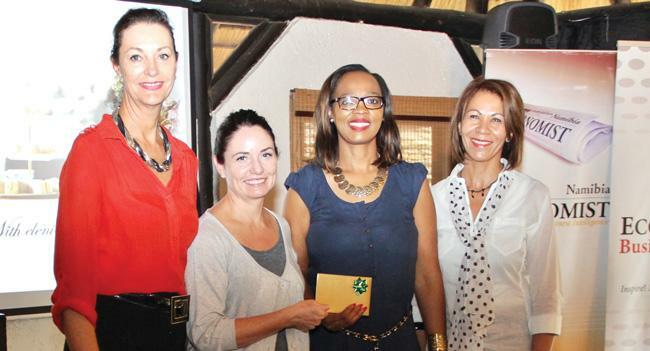 She receives her voucher from (l-r) Desere Lundon-Muller (left), Marketing Manager of the Economist, Karin Fallis (second from left) from Oukolele Day Spa and Hannelie Eksteen from Eleni Skincare Namibia.